Reduced expression of the type 2 metabotropic glutamate receptor (mGluR2), observed in cocaine users, promotes the initial development of cocaine use but protect against addiction, a new study suggests. Scientists supported by the National Institute on Drug Abuse (NIDA) found that rats lacking mGluR2 self-administered more cocaine than wild-type rats when little work was needed to obtain the drug, but less when the work requirement rose—and they were less likely to relapse after a period of abstinence. All three observations are consistent with the mGluR2-lacking rats finding cocaine less rewarding. 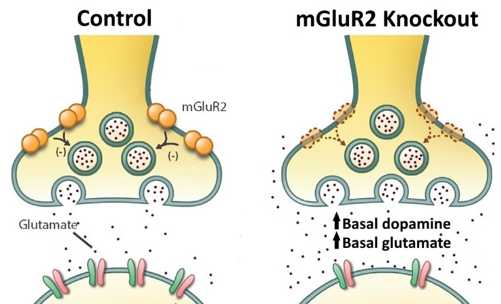 Possibly explaining the blunted cocaine reward, the mGluR2 knockouts had higher basal brain levels of dopamine and glutamate, lessening cocaine’s ability to increase levels of these neurotransmitters from baseline. These findings indicate that the mGluR2 could be a promising target for treating addictions to cocaine and other drugs. Yang, HJ. et al. Deletion of type 2 metabotropic glutamate receptor decreases sensitivity to cocaine reward in rats. Cell Reports. www.cell.com/cell-reports/fulltext/S2211-1247(17)30860-4.